As technology and automation continue to integrate into our lives, we grow accustomed to getting what we need quickly. Whether it is a product, service, or information, we expect rapid response. Laboratory professionals also experience this fast-paced way of life and feel pressured to meet demands. Haste can often lead to mistakes, and when life altering test results or research could be at stake, quality cannot be overlooked or taken for granted. The impacts and costs of potentially bad data can be devastating for everyone affected. Thus, effective workflow management in the lab is critical to achieving the speed and efficiencies needed, while maintaining the quality of results we are all striving for. Given the limited resources of most labs, how can a lab manager effectively implement fast workflows while maintaining quality throughout the process? The first step is to identify which workflow segment to initially optimize. While it is tempting to tackle the entire workflow all at once, that could get overwhelming and not allow for an effective workflow analysis. Start by choosing a segment that has key impacts on customers or researchers. Then break that process down into specific steps, perhaps by work area or type of test. For example, rather than focusing on an entire analyte identification process, select a part of that process. The sample preparation step may be a good starting point, for example. Once you identify a portion of your process you can begin looking at a few key strategies for increasing efficiency. As we explore each of these, we will also discuss how quality is maintained. 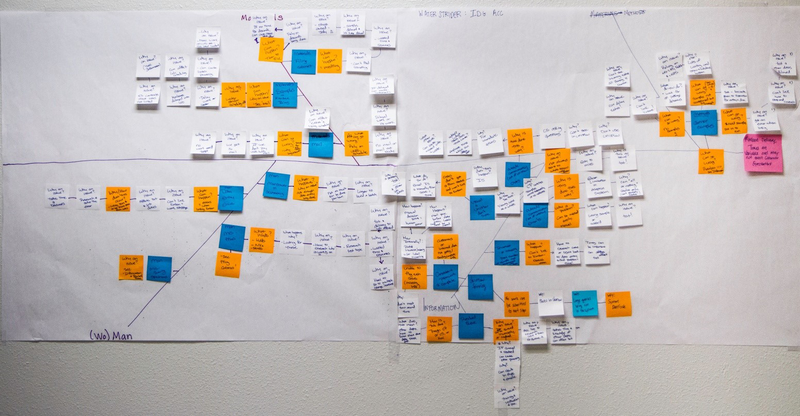 You may find it easiest to use a visual mapping tool, like a process or value stream map, or a fishbone diagram (see example below), to lay out the steps in the process. With such a tool, the steps are visible, and you can easily add sticky notes as you are working on the project. Honestly, the most effective and team interactive maps I have worked on are hand drawn and covered in sticky notes. Don’t forget to include preparation (getting supplies, instrument maintenance, etc.) or cleanup/shut down steps. The more detail the better. The diagram or map used above provides an important tool to help you not only see how the process steps are laid out and how they work with (or possibly against) each other, but also to identify the types of inputs that go into this process. Make sure you detail your process completely, including obstacles or constraints. Here are a few examples of obstacles you may find: equipment strain (not enough equipment to meet test needs), bottlenecks due to work imbalance (one area having a lot of work, and another not having enough), or physical obstacles (such as work areas that are far apart and cause a lot of travel back and forth). As you evaluate opportunities for improvement and detail solutions, don’t forget about keeping quality assurance steps in place. It may be tempting to cut out a bottleneck or an unnecessary step and call it good, but what if there is an important quality supporting piece there? Is the step critical for making that specific process work? If you remove or modify a step, would instrumentation or processing be impacted negatively? What about accreditation or regulatory agency requirements that are integrated into your process? If you find that you need to modify a step associated with quality, look for alternative solutions that maintain quality, but improve your efficiency. For example, let’s say the process you want to change includes a quality review step during the procedure. Rather than removing that step, consider implementing automated tools that help you maintain quality, and also allow you to use resources more effectively. Keep in mind that your improvement evaluation and solution implementation will be unique to your lab and will require a critical eye. This is a great opportunity, as an exercise, to involve multiple team/department members and to gain various helpful perspectives. Variation in processes can have a large impact on efficiencies. If we are all approaching the same process differently, it becomes difficult to gauge how long the process will actually take to perform. We all bring different perspectives and experience to our work – which can enrich our productivity in the long run – but in optimizing any particular process we need to agree on all details as well as the overall approach. Using standard operation procedures (SOPs) or work instructions can help keep us on the same page with the order and details of the steps, and unified training (for current and new employees) is a key element to ensuring these SOPs are executed correctly. Standardization allows for more effective timing, planning and management in the laboratory and hence for improved efficiency. Standard operating procedures or work instructions help reduce variability in the output of the process and therefore are critical for quality. Variability can also cause defects, confusion, and loss of results. Because of this, SOPs and work instructions may be a requirement or, at the very least, highly favored by accrediting bodies or review boards. Automation is a broad category with many different meanings. For data tracking, it can mean incorporating a Laboratory Information Management System (LIMS) or simply adding macro functionality to excel sheets. Whereas for instrumentation it could mean installing a new automated liquid handler or an electronic repeat pipettor. Automation does not have to be large scale to provide benefits, but should be a good fit for the process and flexible enough to grow with your lab. A word of caution before adding new instruments or personnel: Thorough review of the cost and benefits should not be overlooked; throwing in software or equipment for the sake of automating won’t necessarily solve the efficiency problem. (The same goes for adding more people to try to speed up a process.) Make sure you have the space, resources, and that it makes sense for the process in question. Automation can bring great accuracy and precision benefits, as well as time savings, but it can also amplify quality issues in the lab if it’s not specified and set up correctly, and not properly maintained. Implementing new software or equipment into the laboratory should follow a quality check system prior to running your samples. This ensures that the equipment is functioning properly before it is integrated. Also, double check that maintenance and/or calibration schedules are setup and adhered to for the new software or instrument being added. Just because your process is automated does not mean perfect results are automatic. As discussed, there are various ways to increase your lab’s workflow efficiency while maintaining high quality standards. Small updates or changes can result in substantial gains. Improving work instructions, scheduling, or maximizing bench top layout design can also help overcome obstacles and remove bottlenecks. All this can have substantial impacts on efficiency as well as the quality of work being produced. Wherever your workflow efficiency and quality journey take you, remember to be thorough, critical, and fair in your process evaluation. It can be a fun and rewarding journey of growth and a great team unifying experience.